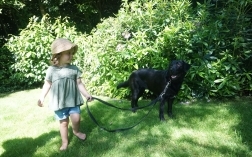 My husband and I love walking in the Lake District so when my 3 year old black Labrador Lily showed an interest in chasing sheep I decided I had to do something about it so that I could keep her from harm and, of course, make sure that no sheep were injured. I decided to go online and see where I could go for sheep training and that’s how I found Ingrid. 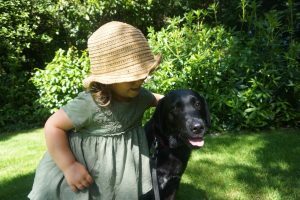 We spoke on the ‘phone and discussed Lily’s behaviour and how I had trained her since she was 8 weeks old. Ingrid opened my eyes to how a puppy should be trained and we then talked about how I might adapt my training with Lily to work on specific areas such as running a long way ahead of me when out walking, pulling on the lead in new places and of course chasing sheep. As I live in Hampshire it was not possible for me to attend one of Ingrid’s courses so we planned to have a day together so that Ingrid could assess us. My husband and I booked a week in the lovely Yorkshire Dales, staying in Sedbergh, and visited Ingrid for our day’s training. After assessing Lily and my handling of her, Ingrid developed a training programme to suit our needs. 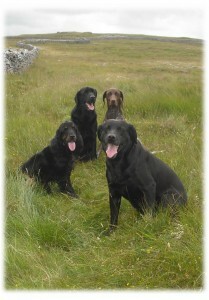 This included heel work on and off lead, recall and controlled off lead walking. We went back to Hampshire to put our programme into practice and then returned to Ingrid when we next visited Cumbria to complete the sheep training element of the programme. Since completing our programme with Ingrid, Lily has become much closer to me, she now watches my movements and if there are any sheep around then she is right by my side. She will now walk with my husband and I rather than 50 or so metres in front of us. I know we still have more work to do to perfect the heel work but I am confident that we will achieve this with more practice. Lily has always been good with children but now she is more in tune with me we have been able to let my grandchildren get much closer to her, still supervised at all times of course! Here are some photos of Lily with my granddaughter Mia Poppy. 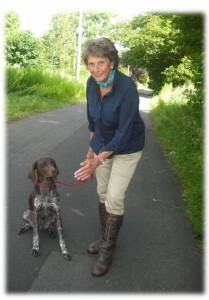 Ingrid’s programme has totally re-educated me and the way I look after my dog. The Grayling Way has certainly worked for us! © Ingrid Grayling Dog Training 2018. All Rights Reserved.